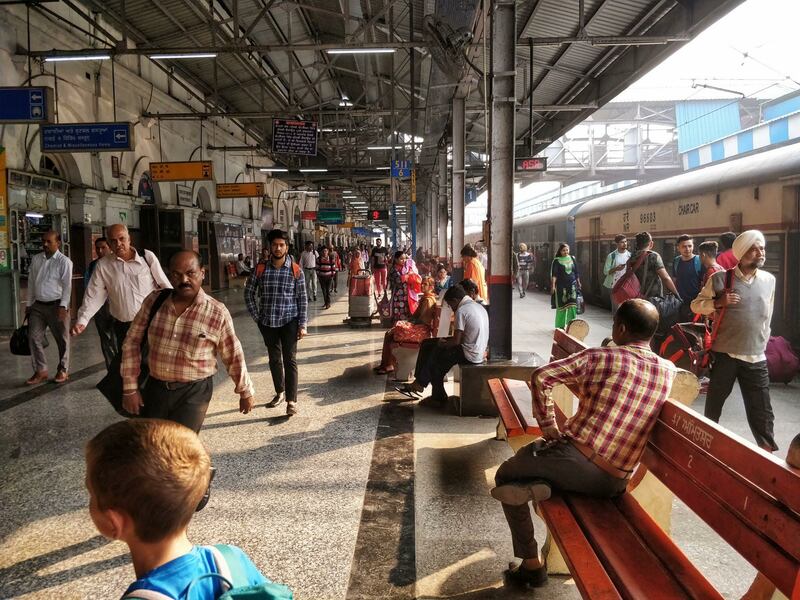 We are now headed to the Punjab region to visit Amritsar with kids. 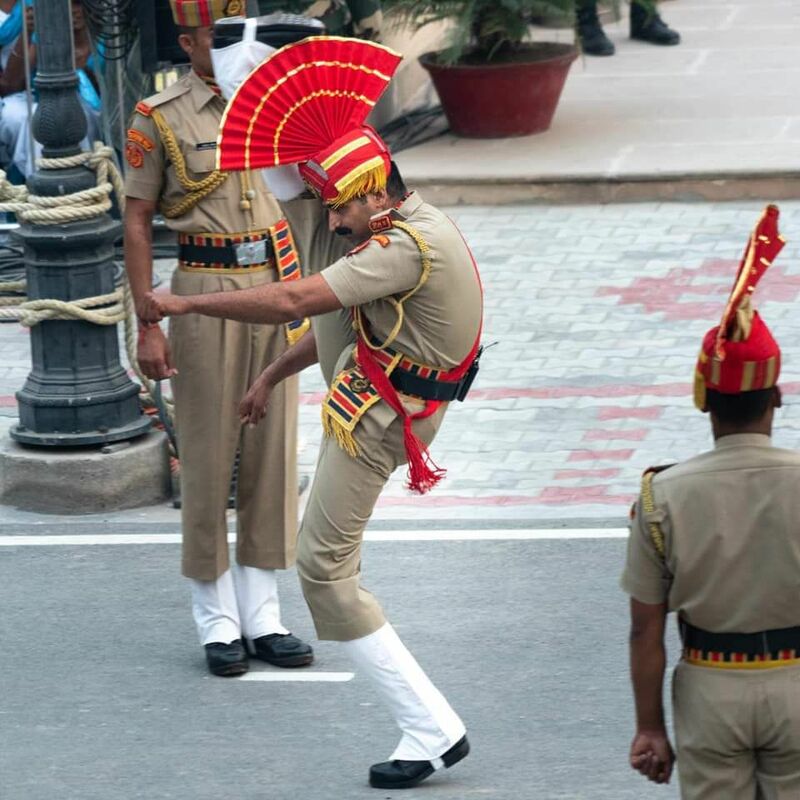 This has to be one of the highlights of our Indian tour. 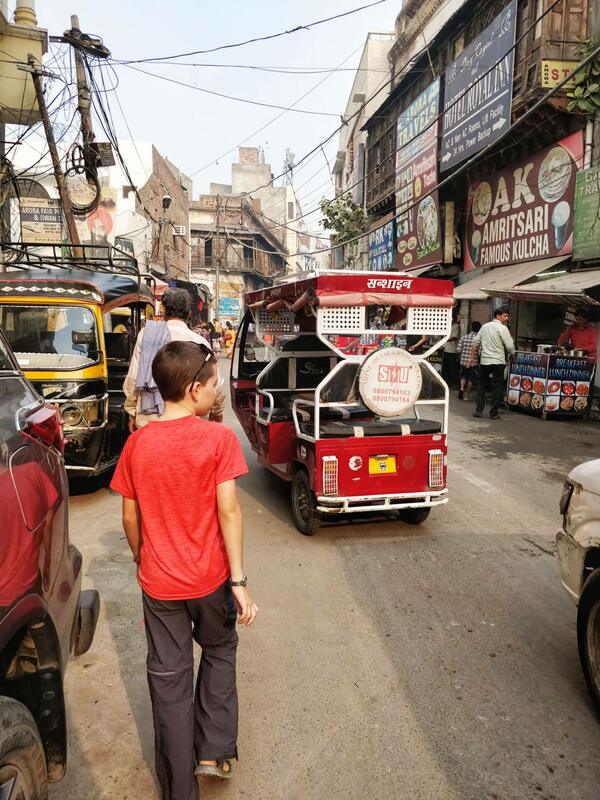 There were quite a few activities within the area, and after a rather chilled trip into the Himalayan mountains it was time to get on the road for more exploring. 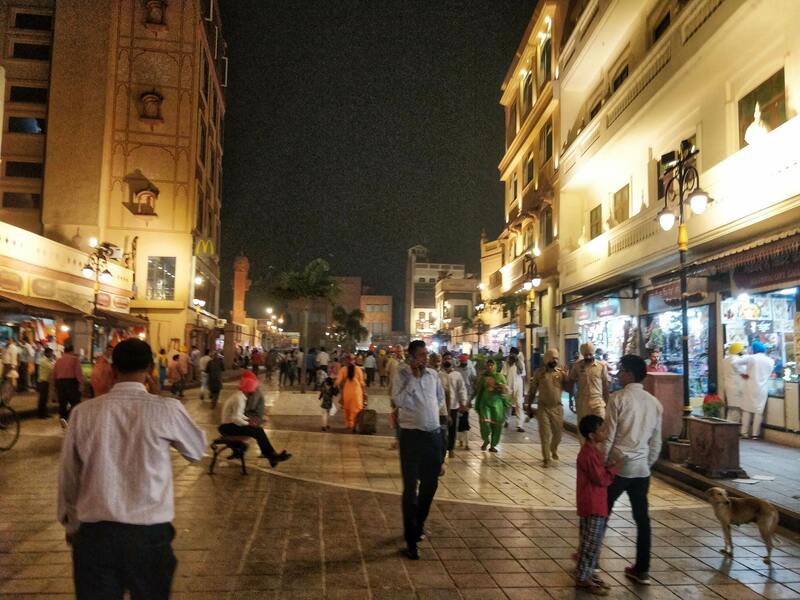 The only thing I knew about Amritsar before arriving was that we were going to visit the Golden Temple and the Wagah Attari Border closing. I was definitely looking forward to getting back on the warmer Indian plains too. Having read too many horror stories about Indian bus journeys I was glad to be back on the trains. O.k. so there’s a few horror stories about trains too, but they feel a little safer to me! However, we had one more little bus journey to Pathankot to deal with first. 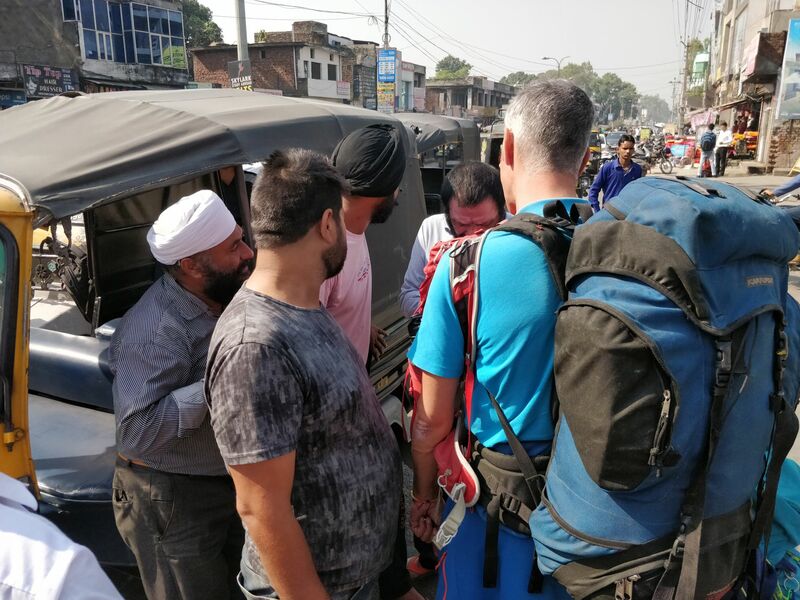 It also required an overnighter in Pathankot in a dive of a hotel before getting up very early to board our train to Amrtisar. Thank God we only stayed one night!! There were actually no walls in part of this hotel!? Regardless, we slept – got up early and were on our way. The kids love train journeys as much as me. They have more room to manoevoure and its better to stretch out. Bliss! The train journey was only a few hours. When we arrived at the train station we were greeted with the usual crowd of Rickshaw drivers looking for business. Keith negotiated with a particular driver but a little tussled and elevated words were spoken as we think someone undercut or stepped on turf. We just kept walking and stayed out of it – just a little girlie spat! ha ha. In fact on this Rickshaw journey we seemed to have gained another passenger. He was very talkative and Ethan was happily chatting to him and saying to us how lovely he was! And he was, but we know this and were waiting to hear his angle. We soon found out as we drove to the city gates…. Now, vehicles aren’t allowed within the pedestrian area and our hotel was on the outskirts of this. However, our Rickshaw driver suddenly said he couldn’t get us to our hotel. But it’s o.k. as our ‘additional passenger’ knew of a hotel and wanted us to come and have a look and check it out. Our repeated answers of ‘no’ were just falling on deaf ears. So we grabbed our bags. Paid the driver less than he stated (because he didn’t take us to our hotel) and walked the rest of the way. To be fair it wasn’t too far but it was a hassle! We stayed just outside the main pedestrian area . It was down a darker side street, but we never felt unsafe there. It was an OYO hotel, which are a group all over India. The hotel itself was fine, the room was in good condition, and the area was a little basic but fine. 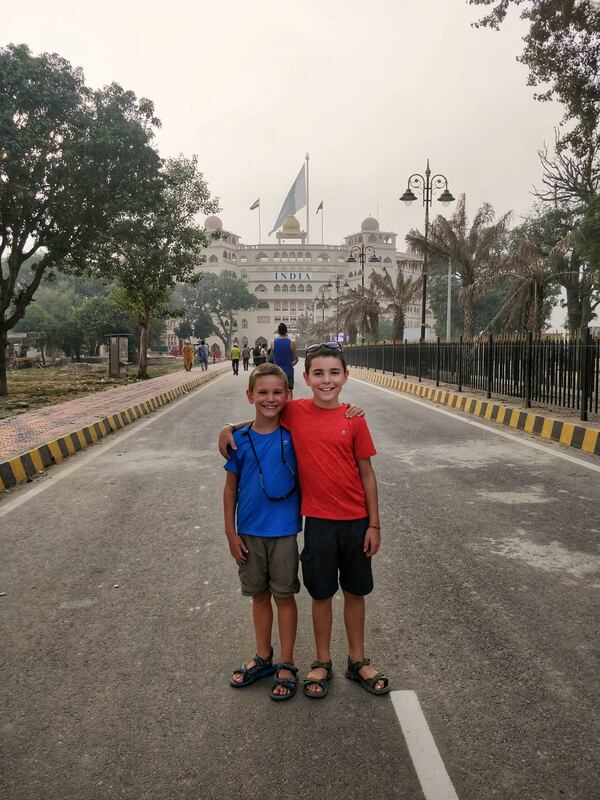 The staff though were brilliant – namely because Ethan had left his Kindle at the Pathankot hotel. The lovely owner there had arranged to have it packaged and put on a bus to us and our hotel owners went and picked it up!! Bonus! 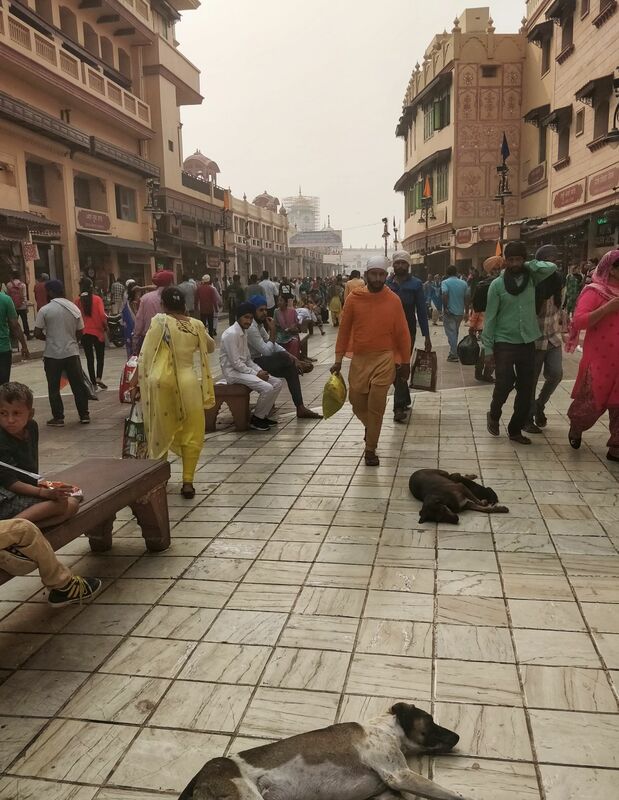 There are a few hotels within the pedestrian area of Amritsar, but if you can get somewhere on the outskirts it makes it easier access to the Golden Temple. 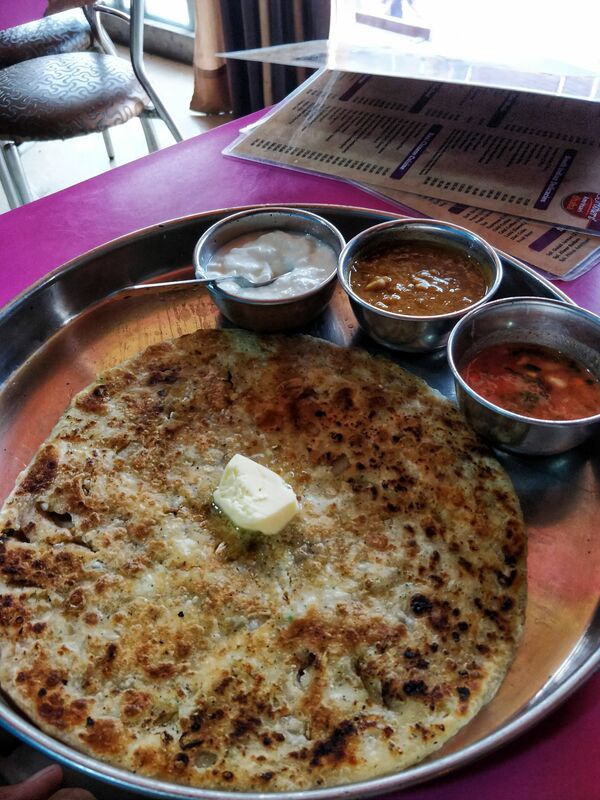 Neelams – it always seemed busy here and we enjoyed the vegetarian food served here. We were able to request less spice in the dishes. Keith was pleased he was even able to order his favourite Masala Dosa! 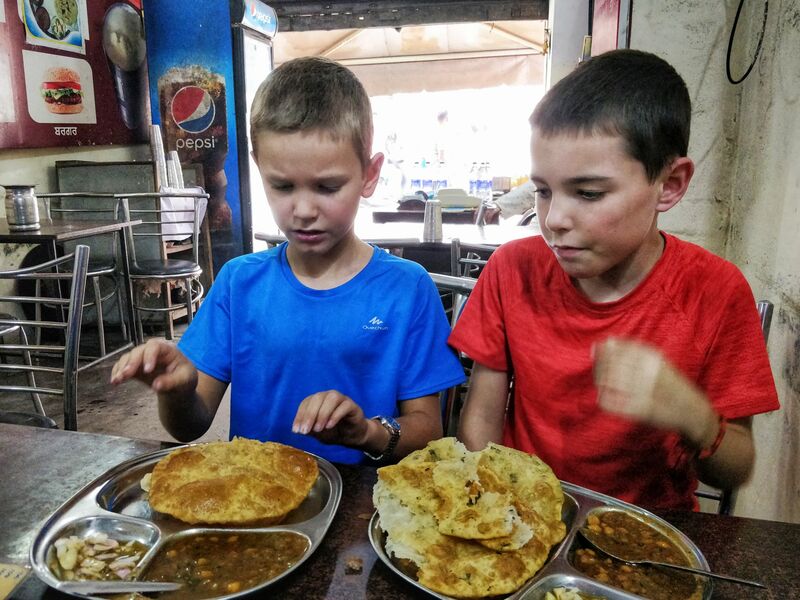 Brothers Dhaba (near McDonalds) – we visited for breakfast one morning. The coffee was the typical sweet milky type so not our preferred choice. The food was o.k. but again the options were too spicy for our tastes. It did have nice views looking over the street area if you got near the window. Cafe Coffee Day – we’ve visited this chain a couple of times around India and knew their coffee wasn’t too bad so we called in for a cup and some snacks (usually samosas) for the boys. McDonalds – yep, it made the list! Mainly because it is a totally vegetarian restaurant! Its situated in the pedestration area (as well as a Subway) so easy to find. The boys were mega tired this day and just wanted normal food. So we agreed to let them have a Mcdonalds. They weren’t too disappointed and the french fries tasted the same. It’s FREE! Unbelievable I know for such a stunning facility. 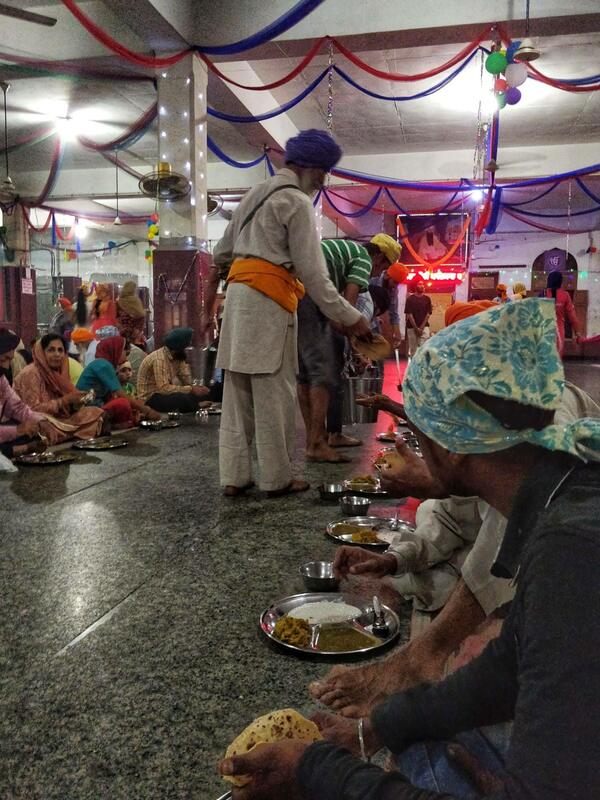 There is a kitchen facility within the temple which offers free food to all who attend. However, there is a donation counter inside with a recommended donation fee. You are required to be appropriately dressed to attend. Women should have their legs covered as well as their head and shoulders. Men (including our boys) need to have their heads covered (we used our buffs). 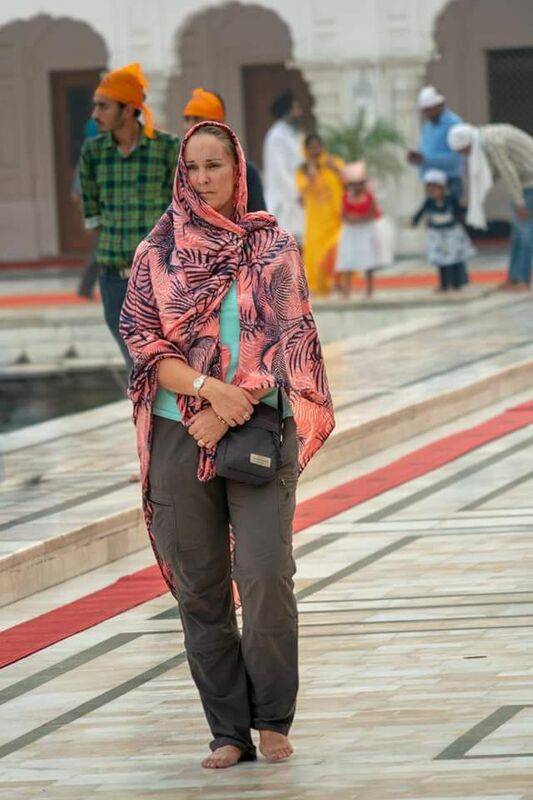 No large bags are allowed within the temple, but ladies handbags are o.k. 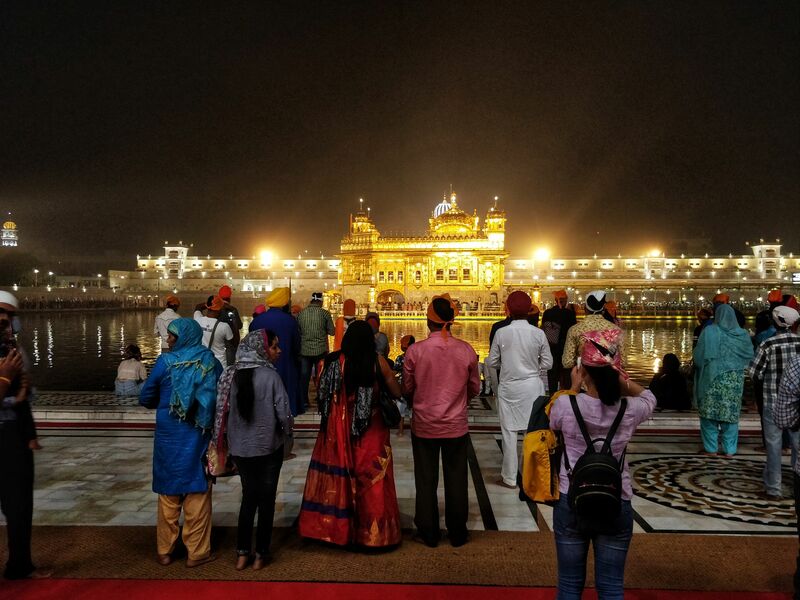 The Golden temple is perfectly located on the edge of the pedestrian area. As you approach there are a number of counters on the left. This is for your shoes you can only walk barefoot around the temple. You then need to walk through a cleansing pool to clean your feet first. Then enter through the main doors. The sights before you as you enter are stunning. 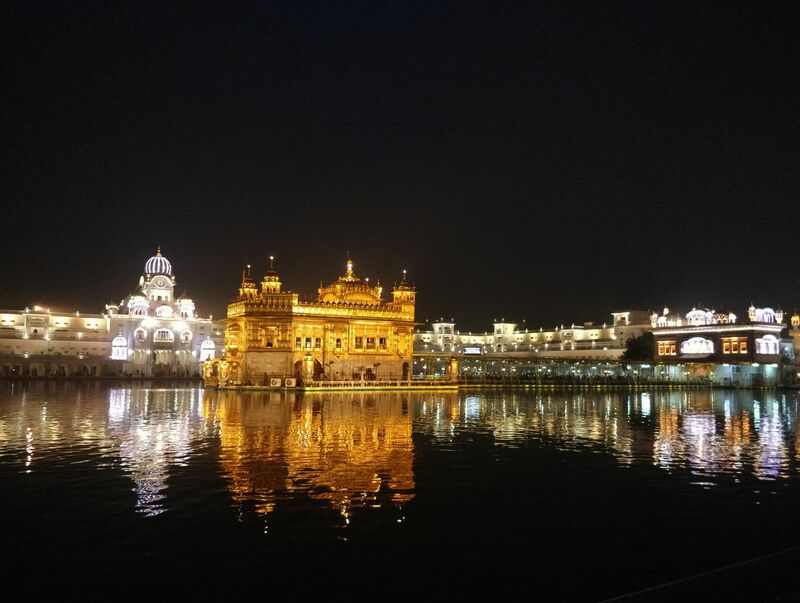 The whole palace is pristine white with a glowing golden temple in the middle of a lake. It really is a sight to behold. You are free to wander around the area and take pictures, take in the view but it is frowned upon for you to take pictures of people who are bathing or praying. This is a place of worship. We did visit the kitchens at the temple. This is situated on the far left of the complex. Walk through the archway and the kitchens are on your left. We just followed the crowds. But note, weekends and holidays are the busiest time! At first you are handed a silver platter, then a spoon and fork and a cup. You then carry this into a great hall and are guided to sit down on the matted floor. People fill in next to you. Then volunteers come around and fill up your platter with food and drinks. You get a veg curry, rice, chapatti etc.. Basically a small Thali. It was very nice food actually. They keep coming to fill up our plate until you are finished. If you wish to have another chappatti hold 2 hands out. All very well organised and fascinating to be a part of. I do believe you can also just turn up and ask to help. The places is all run by volunteers – amazing! It was starting to get dark as we left. We sat and watched the clouds darken and the lights start to shine across the lake and light up the golden temple. It was a very spiritual and calming place but not somewhere the kids can go crazy. However, we explained this to the boys and they were very respectful. In fact, Jasper went very zen on us! We left as evening prayers began but it was very enjoyable. 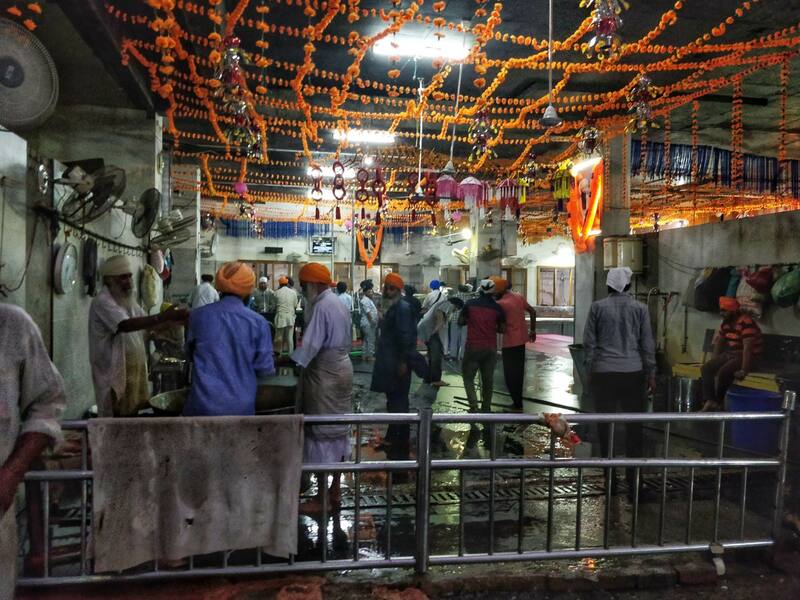 *NOTE: we’ve recently found out (Jan ‘19) that photography has been banned inside the temple. I’m not sure if this is a temporary measure. It’s a shame as it’s a beautiful temple to show the world… I’m glad we have our photographs to enhance our memory of a wonderful! Remember to take your passports – you are at a border crossing!! Another free and fantastic event that you can’t miss if in Amritsar. The border crossing has to be the most vibrant and exciting thing I’ve ever seen! The noise and atmosphere was just electrifying!! We arranged a shared taxi to the border, which is around an hours drive away. 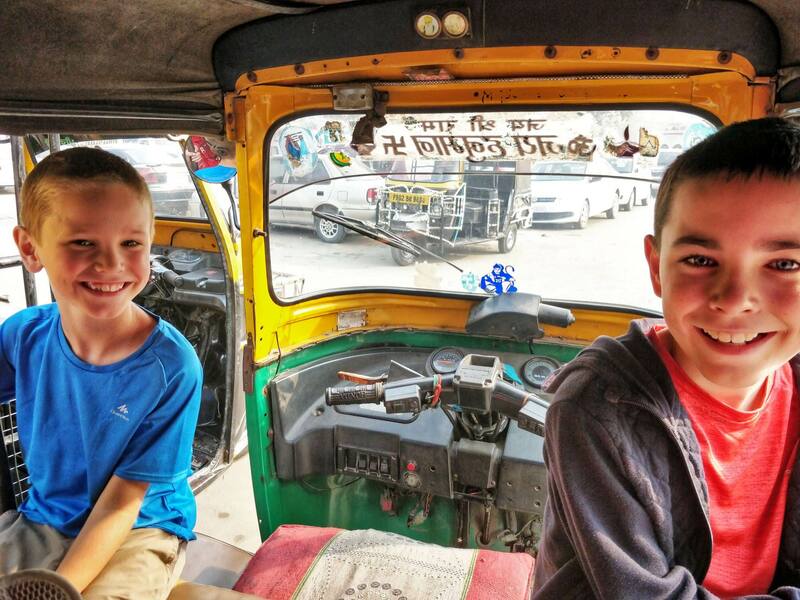 I’d recommend a car over a tuk tuk, due to the length of time it takes to get there. It was a little squished in a car share, but meant we reduced our overhead costs. Of course if you have the money get a private car! In total we paid Rs800 for all of us return journey. 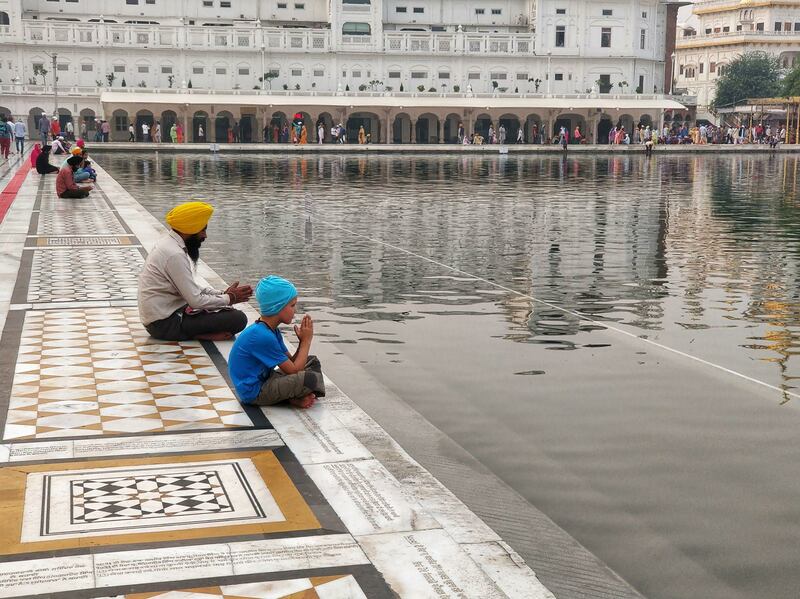 There are many touts around the golden temple area who are looking to do a deal. We left at 1.30pm and arrived at the border area at around 4pm. We were dropped about a 15 minute walk away from the border entrance. It was easy to find where we were going as everyone was heading that direction. There were parking spaces closer than this but it looked like these were organised tours (and no doubt more expensive). We had to pass through a security check, so again no big bags are allowed. There is a passage for VIPS, which is also meant for westerners so jump in here and avoid the big queue. It was a seemless process and we were soon walking towards a wall of noise! Westerners are guided to one area of seating with nice seats, while the indians were huddled into the harder seats in a separate section. A bit bizarre but hey! I was suprised that when we arrived at 4.20pm the seats were nearly all full! You need to get there quite early it seems. Either way, we could see everything and the party was in full swing. I say party as there were people running with the Indian flag and cheering, then Indian music was being played and all women (yes, only women for some reason) headed down to the road area and dancing enthusiastically! It was crazy loud and looked a lot of fun. There was a guy down there with a microphone who’s job it was to chivvy on the crowd! It turned into such a show with India competing with Pakistan for enthusiasm and noise! It was so crazy and hard not to get swept up in it all. 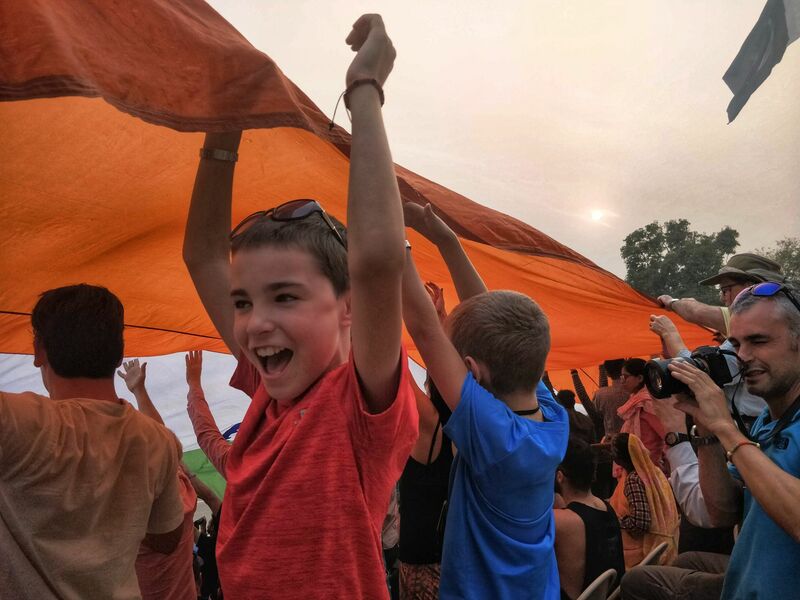 The kids were loving it screaming “India, India, India!” ha ha. Soon the guards arrived ready for the real ceremony! They were all dressed in their attire and we watched them act out their routine of bravado. There were women who quick marched their way to the border before the men started their high leg kicks all to drums and symbols. I couldn’t believe what I was seeing and still have no idea how they get their foot above their head!!! This went on for around half an hour with the gates opening and a formal handshake taking place. The flags were then lowered and folded. It was all in good spirit and was quite the performance! Crazy. It all finished around 5.40pm and our driver had said he would return to the city at 6pm so we had to make a mad rush to get back to the car. 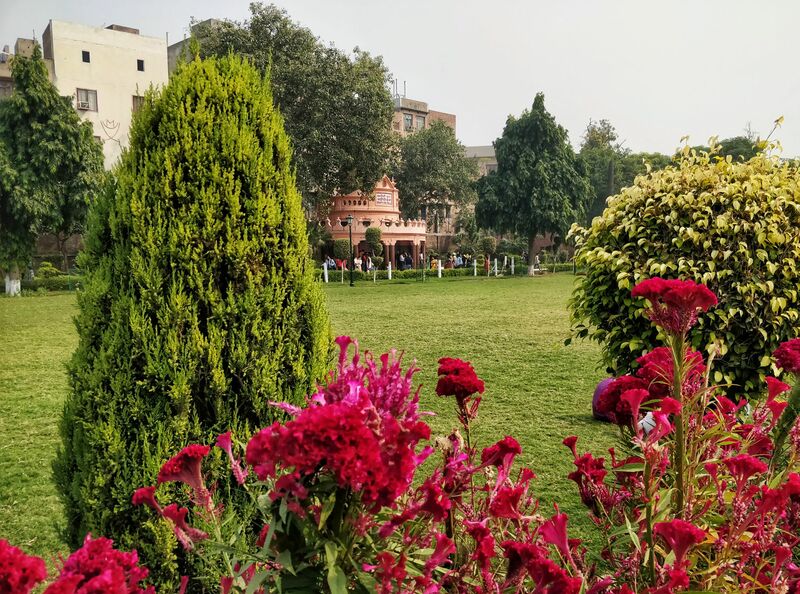 Within the pedestrian area is entrance to the Jallianwala gardens. 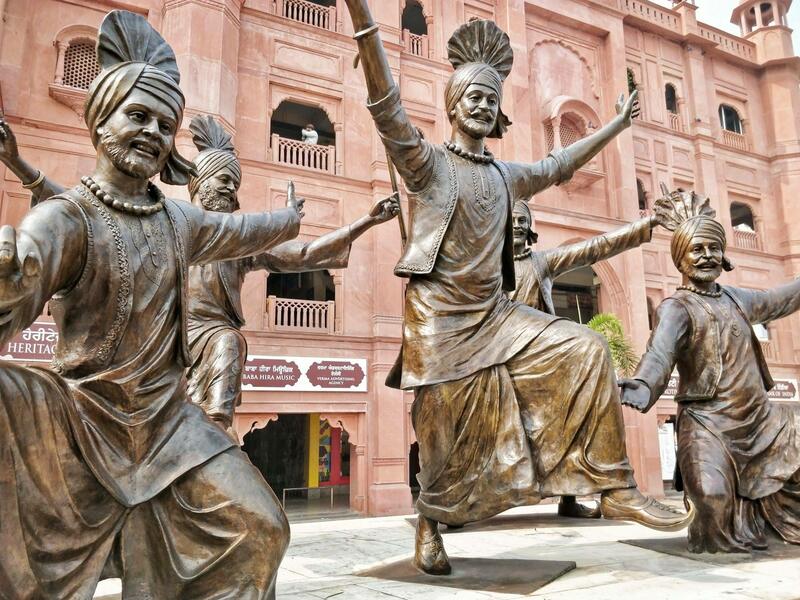 A place which is held in the memories of the Punjab region namely due to the massacre here. It happened in 1919 when the British army fired upon a peaceful demonstration and killed over 1000 indians in cold blood. The gardens are now a memorial to those who died. I found it very moving and not something I’d ever heard about. Namely, because they wanted to brush it under the carpet. What a truly devastating time for these local people. There are several buildings with the bullet marks clearly marked with the stories highlighted through billboards around the area. The story told of a well that people jumped into to escape the bullets, but met their peril – such a sad story and an atrocity! 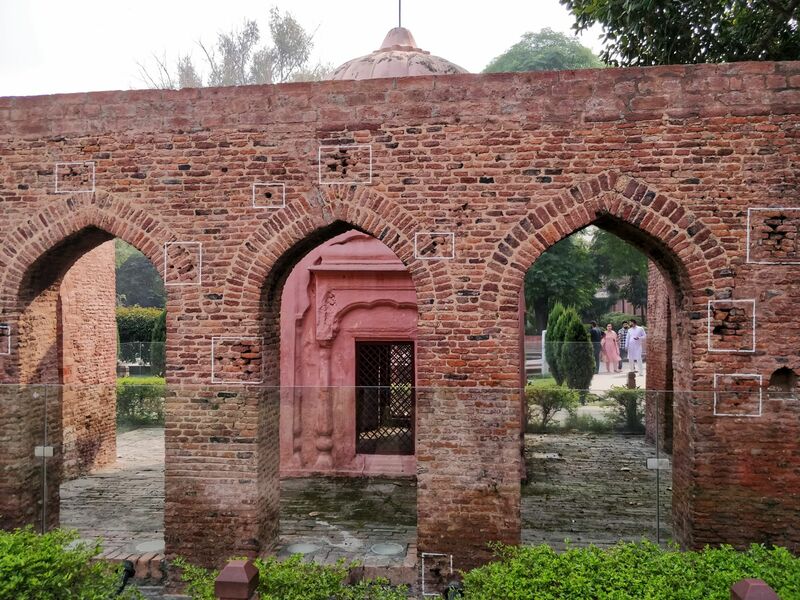 The partition museum depicting the strive for the independence of India and later the separation of Pakistan. The Maharaja Ranjit Singh Museum, which is dedicated to the Sikh empire founder with armour, paintings and other historical objects. There are a number of shops and eateries within the city walls. It was always busy and around this area, even at night. I really enjoyed the feel of Amrtisar. It had a nice clean town centre with a number of attractions nearby. The best of these was the Golden temple which is amazing! 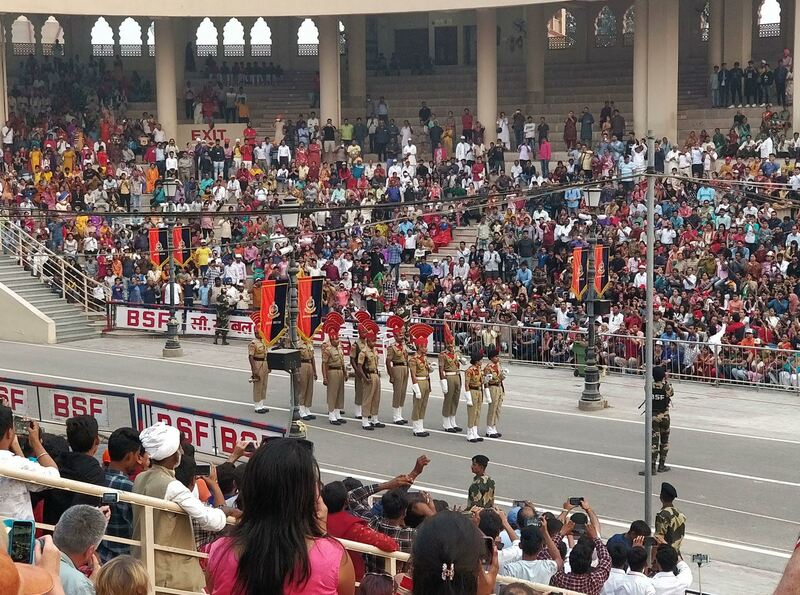 We also thoroughly enjoyed the famous Wagah Attari Border Ceremony, especially the boys. The atmosphere and hype surrounding it was just phenomenal. I mean, India is loud at the best of times, but this was on another scale. And their legs.. you have to see it to believe it!! 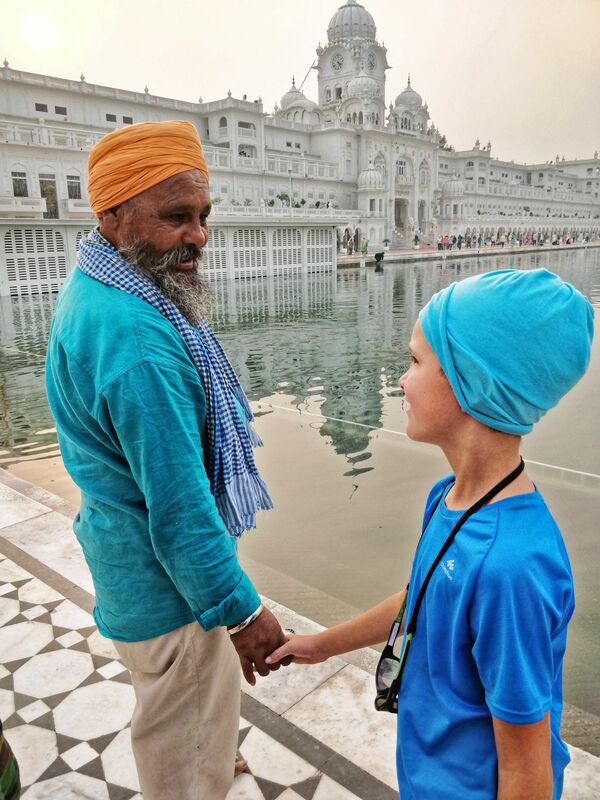 I would definitely put Amritsar up there with one of my favourite places to visit in India with kids!